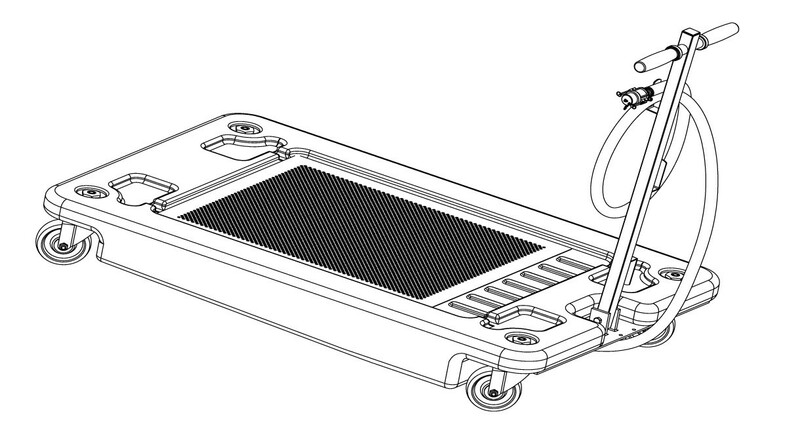 This drain is designed for use with a 16-gallon open top drum for collection of used oil. 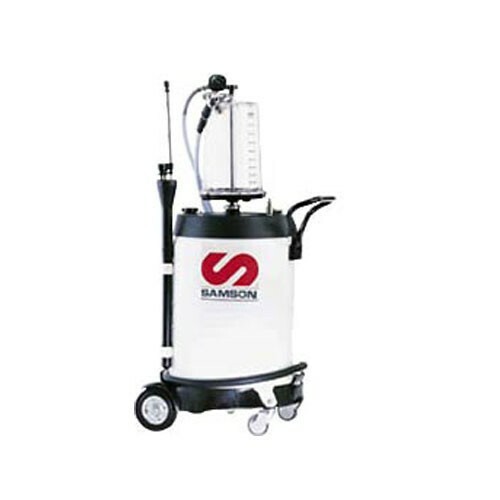 Samson 3726 suction unit is designed for use with all types of passenger cars, trucks, tractors, aircrafts, boats, etc. 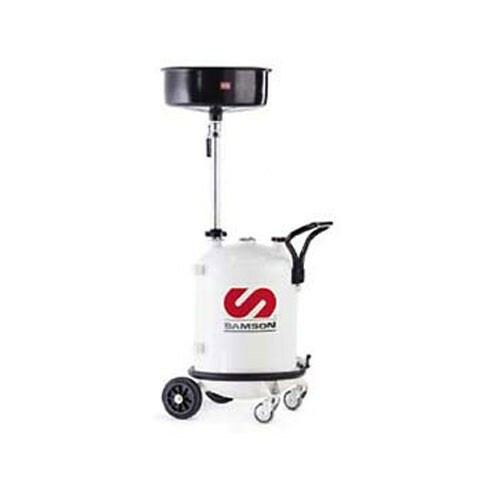 Samson 3721 unit includes a 10 quart transparent chamber that can be used as a vacuum reservoir and allows an immediate inspection of the evacuated used fluid. 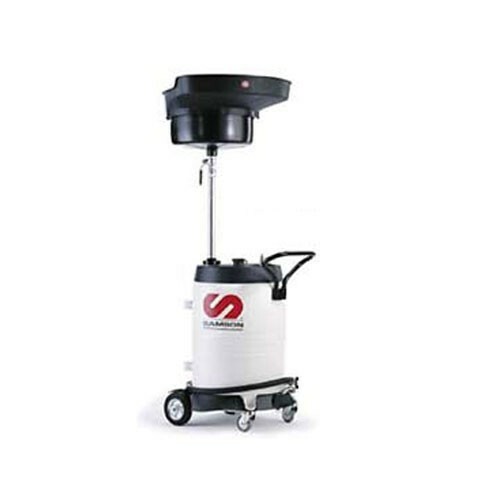 This Samson 3725 combo suction and gravity drain is ideal use with all type of passenger cars, trucks, tractors, etc. This 3720 mobile waste oil suction unit includes a 10 quart transparent chamber. 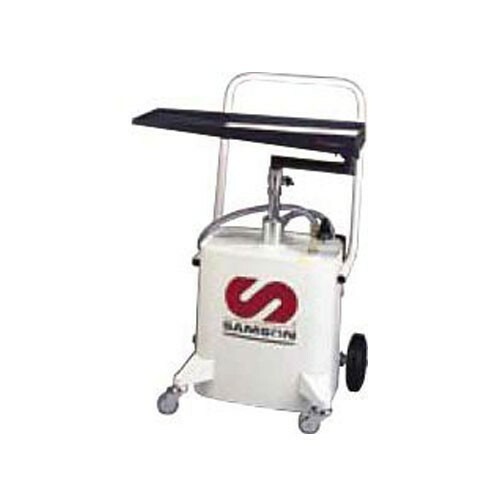 Samson 3724 portable used fluid drains is utilized for collection of motor oil, gear oil, anti-freeze, and other vehicle used fluid in Class IIIB. 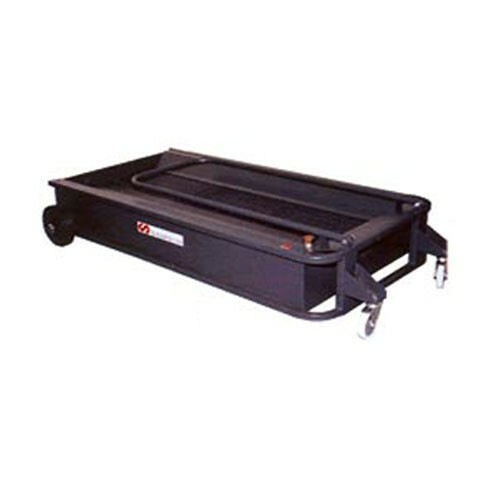 It is suitable for use under vehicle lifts or inside lubrication pits. 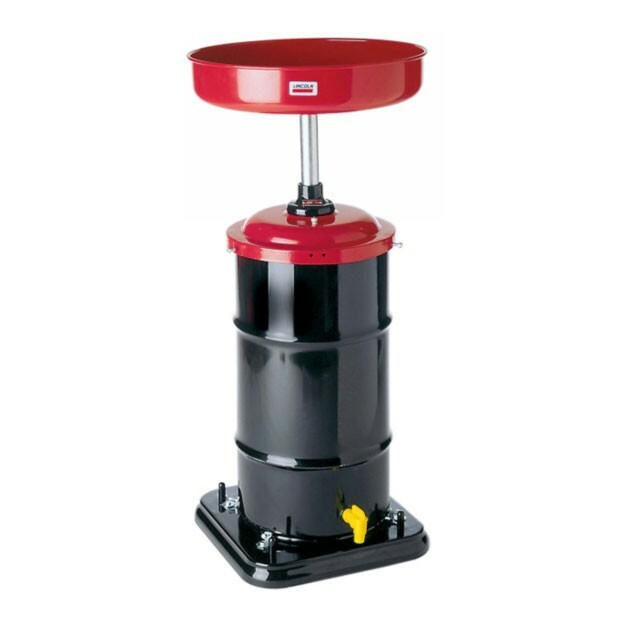 Samson 3723 can be drained by either a valve on the bottom of the unit or by an external suction pump connection on the top of the tank. This Samson 3736 is a portable 18 gallon standard pressurized evacuation unit for suction of used oil. This unit is ideal for use with used oil. Samson 3734 Drain Unit has a built in safety valve to prevent over pressurization of the tank. Shop air is used and unit is emptied through a 6.5 foot discharge hose. 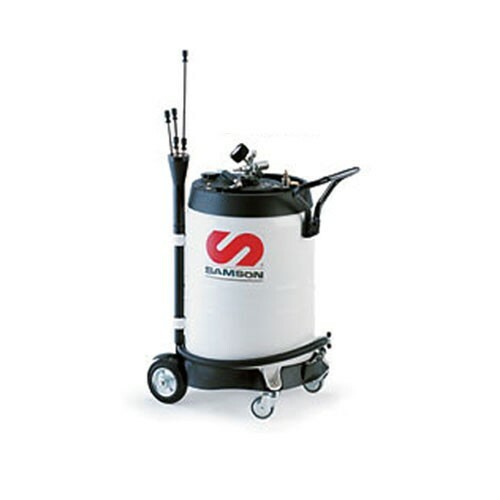 The Samson 3733 can be drained by either a valve on the bottom of the unit or by an external suction pump connection on the top of the tank. 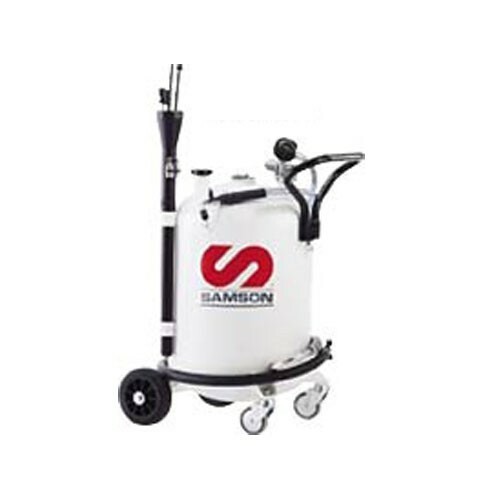 Samson 1336 is a special low-profile pressurized oil drain with swing-arm funnel tray. Allows easy positioning for hard to access drain plugs. Ideal for motorcycle, marine, off-road, lawn, farm and in-plant use. 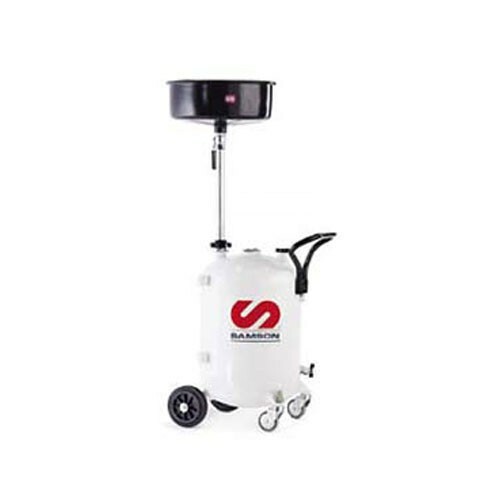 The Samson 135100 is a traditional used oil drain for use on customer supplied 16 gallon keg. This heavy duty deluxe 28 gallon used oil wagon is easily connected to a pumping system for evacuation. 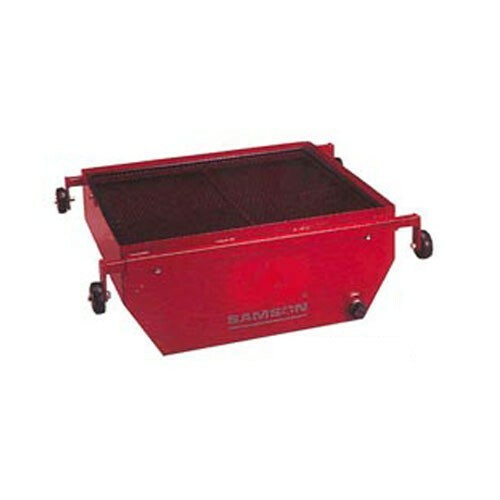 Samson 1355 is a heavy duty rolling pit drain, holds 34 gallons, for use with used oil. 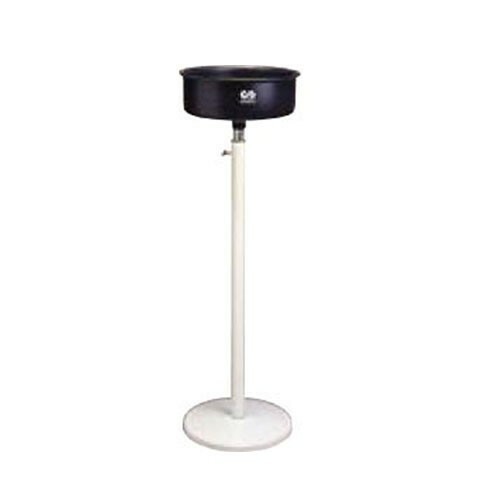 Samon 1360 is a heavy duty pedestal type drain. Extends to 78”. Includes 17” thick steel, 5 gallon bowl. Lincoln 3665 17 gallon truck drain features a 6 ft. (1,8 m) long discharge hose with a 3/4" camlock style connector and cap. Low-profile design can be easily positioned under high-clearance vehicles for capturing used fluids including motor oil, coolant and transmission fluid. Lincoln 3667 17 gallon truck drain features a rotary hand pump and a 6' long discharge hose with a steel J-hook installed at the outlet. 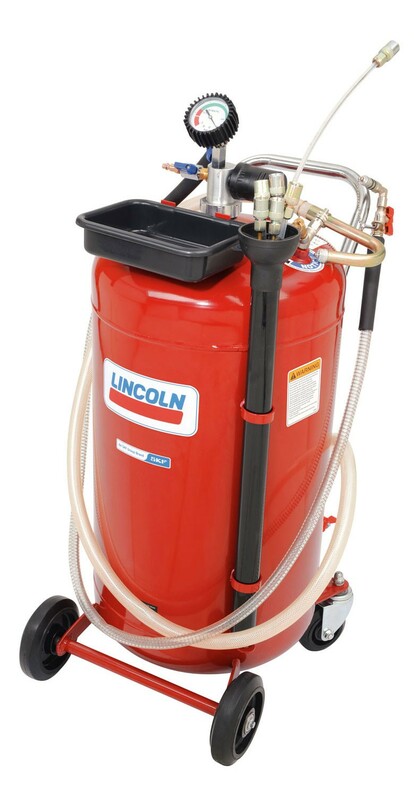 Lincoln 3669 truck drain with a 120 V electric pump features a 17 gallon (65 liter) capacity reservoir molded from robust. 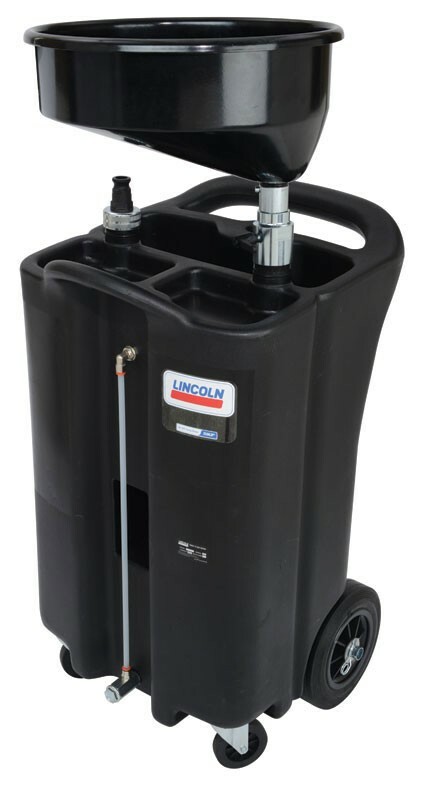 Lincoln 3626 features a black reservoir for identification of common used fluids. 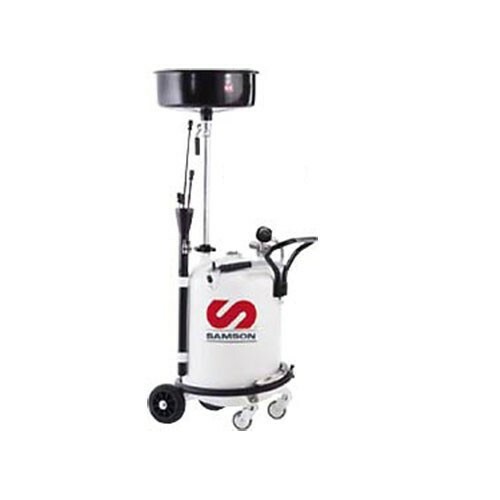 It is designed for use with pump-assist used fluid collection and transfer systems, which is ideal for large multi-bay shops and applications or environments where movements restricted. 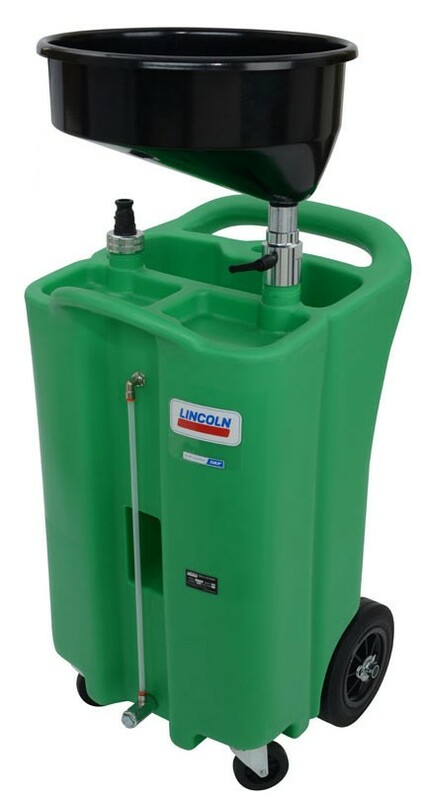 Lincoln 3627 features a green reservoir for easy identification of used coolant. 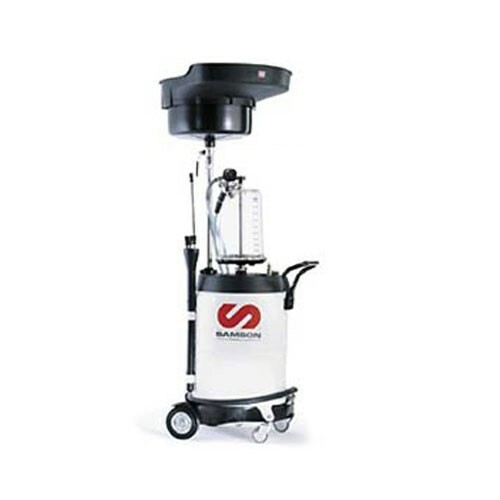 It is designed for use with pump-assist used fluid collection and transfer systems, which is ideal for large multi-bay shops and applications or environments where movements restricted. 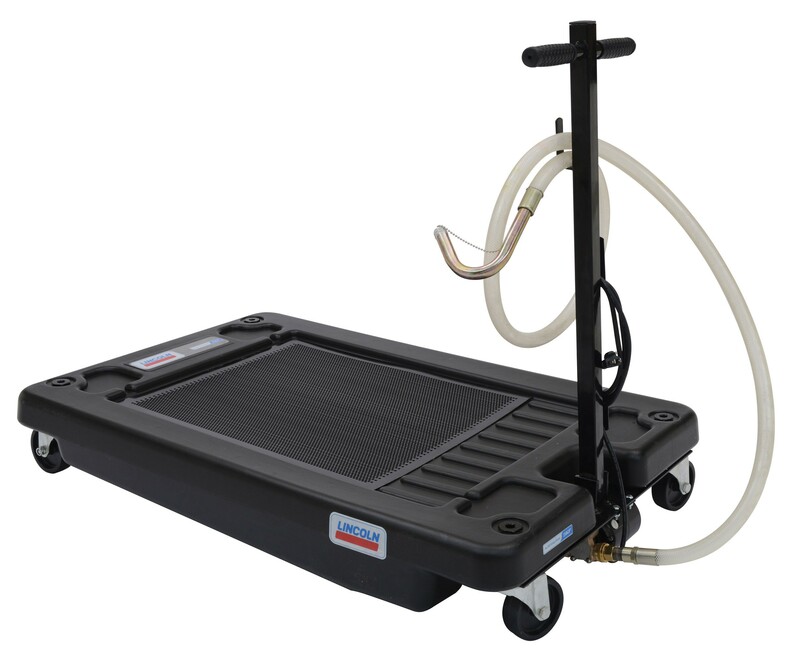 Lincoln 3635 gravity drain has a portable upright configuration commonly used for collecting fluids under lift-mounted vehicles. 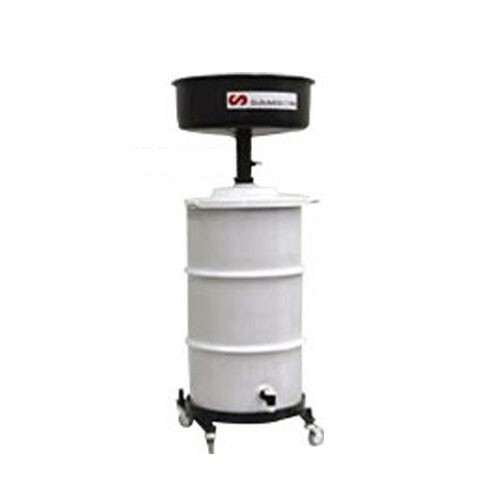 It offers a 15" (381 mm) offset funnel that includes a removable filter screen and wide-mouth extension that increases the diameter to 24" (610 mm). 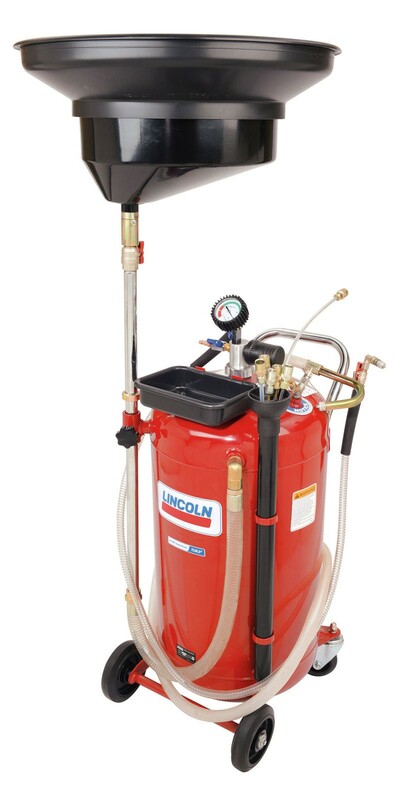 Lincoln 3637 used fluid evacuator utilizes a powerful compressed-air-operated venturi to quickly extract fluids from reservoirs or directly through a dipstick tube. 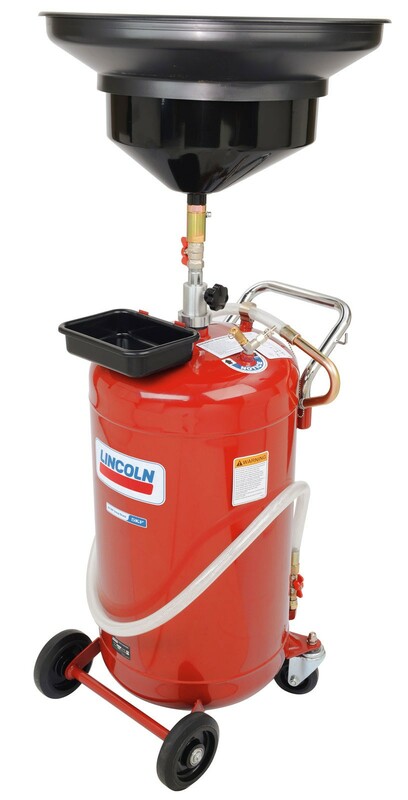 Lincoln 3639 25 gallon combination used fluid drain and evacuator combines the features of the 3635 drain and 3637 evacuator into a single unit, giving operators the choice to collect fluids by gravity from lift-mounted vehicles or using a venturi to extract fluids directly from reservoirs or through a dipstick tube.